Hey everyone! Today at The Book Bratz, we're participating in the Blog Friends Forever Tour! For anybody who doesn't know what that is, it's a blog hop dedicated to promoting a whole lot of blogger love. Today, we're going to be highlighting some blogs that definitely should be checked out because they're super cool! 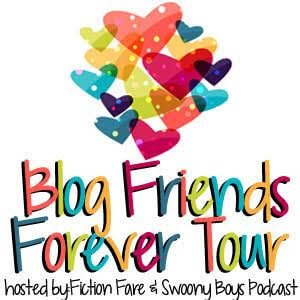 If you have any other questions about the BFF Blog Hop or want to see the full tour schedule, you can check it out at the Swoony Boys and Fiction Fare. 1. Living in a World of Book Quotes. Jaclyn, the blogger behind Living in a World of Book Quotes, is super fun and awesome! We've met her in person at BookCon for the past two years and she's a total sweetheart - and her blog is pretty awesome, too! She talks about all sorts of book quotes that us bibliophiles know and love - some happy, some sad, some swoony, some funny, etc. If you never need any sort of quote for anything (such as your senior yearbook or any school project or an Insta bio or anything), her site is definitely the place to go. 2. The Petite Book Blogger. Victoria participated in our 2015 Summer Blogger Promo Tour, and we instantly got to know her and took a liking to her. She's a super sweet girl and a great blogger, so you should definitely check her out! Her blog has a beautiful, fresh, chic design that automatically grabs your attention in a subtle way as soon as you log onto her blog. We love her funny GIFs during her Waiting on Wednesday memes, too! If you're looking for something fresh and chic, head over to Victoria's blog! 3. Sassy and Dangerous. Talina was another participant in our 2015 Summer Blogger Promo Tour, and that's also how we got to know her! Her blog is full of fresh, funky (and definitely sassy) designs that instantly pop off the webpage. Whoever designed her layout was a genius - because we absolutely love it - colors, organization, and all! Talina's reviews contain some funny GIFs, a lot of sassy humor (but of course), and great, well-formed opinions on everything she has to say. You definitely need to check her out! 4. Ana Loves. Ana is another total sweetheart! We met her at BookCon for the past two years and she's been nothing but kind to the both of us. She's funny and easy to talk to, and is a great friend alongside being a great blogger. She has some cool memes on her site, such as her Harry Potter Moment of the Week and Scream Queens Saturday! If you're looking for a blog with tons of traditional memes and features alongside some new and creative ones, we definitely recommend heading over to Ana's blog. 5. One Way Or An Author. Aila is yet another blogger whom we met on our 2015 Summer Blogger Promo Tour, and we're so glad that we did! Her blog's banner makes us giggle every time we visit the site - "One way or an author, I'm gonna read you!" (Get it?) Aila also has some fun features such as Swoon Thursday and Fan Art Friday, where you can gush over some adorable characters and also see some pretty cool fan art submitted by Aila herself - she's crazy talented! So if you're looking for some new bookish phone wallpapers or a space to be create, we definitely recommend heading over to Aila's blog. Check out the other posts on the tour today! As a part of the Blog Friends Forever Blog Hop, we have a current tour-wide giveaway going on! We are giving away $75, $50, and $25 gift cards to the winner's choice of book retailer - so good luck and get started on your Rafflecopter entries! We'd like to thank everyone who is participating in the BFF Blog Hop for having us and letting us join in on the journey - and for all of our followers for reading and participating! We definitely recommend giving those five blogs we mentioned earlier a follow and check them out - they'll definitely be worth it and they deserve a whole bunch of publicity! Do you know any other blogs that you think deserve recognition? Comment down below! Ahh, thanks so much guys!! <3 <3 <3 The Summer Blogger Promo Tour was so amazing though, with a bunch of awesome bloggers - I'll definitely be joining the next one if it happens! A weight loss prescription needs to be an individual prescription and appropriate for you and only you. We are all very different, in age, weight, gender as well as having a wide variety of lifestyles, health issues, fitness levels, and previous experiences of trying to lose weight, all of which will alter the prescription. Research now shows that just a 10 percent reduction in your body weight can reduce your health risks and improve any current medical conditions considerably.